Power is a modern-day luxury that no one could go without. The wires that bring electricity to your home are typically hidden behind the walls of your house. Yet this almost invisible system can have big impacts on your day-to-day life and even your ability to find home insurance. In my work as a home inspector in the greater Toronto area, I sometimes come across knob-and-tube wiring still in use. 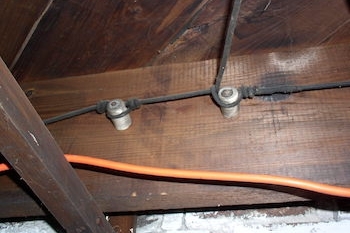 Knob-and-tube wiring is found in homes built between 1880 and the 1940s, although builders continued to use it sporadically for several decades after that. In an area like Toronto, where many homes were built toward the beginning of the century, knob-and-tube wiring systems are not uncommon. What do you need to know about knob-and-tube wiring? Let’s start with a comparison between old and new. Modern wiring and knob-and-tube wiring systems both look and function differently. Knob-and-tube wiring systems get their name from how they look: wires wrapped in fabric or rubber tubes run through ceramic knobs that keep the wires away from wooden frames. These systems require two separate lines—a black (hot) wire and a white (neutral) one. There is no ground line. In modern wiring, black and white wires, plus a ground wire, are wrapped together in a single, plastic-sheathed cable. Because knob-and-tube systems have no ground wire, electrical outlets typically only have two prongs, not three. These systems also are limited to 12 circuits, although previous homeowners may have elected to add additional circuits, which does risk overloading the system. Wondering how you can tell which system you have? Knobs and rubber-enclosed wires are a big giveaway. Two wires that run next to each other instead of one tube indicate a knob-and-tube system, as do antique electric panels and outlets. The best way to evaluate your system, however, is to have a home inspector take a look. While knob-and-tube systems are older, if they are functioning properly, they can still be used. However, living with a knob-and-tube system does come with some risks that homeowners and buyers should be aware of. Lack of a grounding line. The lack of a ground wire can be a shock hazard because errant electrical surges will be directed through you instead of the ground wire. No temperature rating. High-heat areas can cause brittle wires, which can lead to systems that short-circuit frequently or stop working altogether. Free-air system. Knob-and-tube wiring is meant to be a free-air system, meaning the wires stand away from surfaces because of the knobs. But modern insulation can reduce breathing room and become a fire hazard. Low current carrying capacity. The majority of knob-and-tube systems were simply not meant to handle the number of electrical devices used in most modern homes, which can cause circuits to short and overheat. Many homes built with knob-and-tube wiring have been renovated to use more efficient and safer options. Do keep in mind that replacing the wiring throughout your house is not required—however, you should be aware that some insurance carriers will not insure your home if you have knob-and-tube wiring due to the increased risks with the systems. Others may charge higher premiums. Contact your local insurance carrier for more information. If you are a homeowner, don’t feel pressure to replace a fully functioning knob-and-tube system. Do, however, make sure you have an annual inspection done to ensure your system is safe and wires are in good shape. If you’re a prospective home buyer, we recommend getting a home inspection before buying to see whether your future home has any conditions that you may want to consider before you buy. It’s important you go into a major buying decision with as much information as possible including potential future repair expenses. Replacing an electrical system can be costly, but if the home you fell in love with still has an antiquated electrical system you may be able to negotiate the price of updating the system with the home seller. If not, you can at very least budget for future repairs. To schedule your home inspection today, please contact our HouseMaster franchise, located in beautiful Toronto, online, or at 416-MASTER1.